In the second pAsuram, parAnguSa nAyaki speaks about how emperumAn‘s beautiful, divine nose is tormenting her. 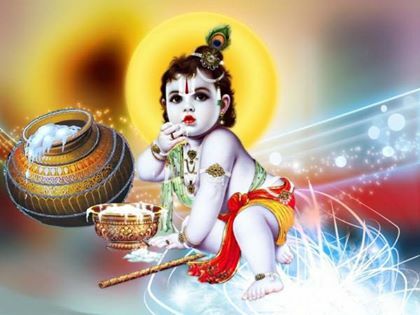 Subsequently, parAnguSa nAyaki says “The nose of krishNa who became butter thief due to his desire for the belongings of devotees, is shining in my heart”. In second pAsuram, as her friends are of the same age, knowing her suffering, they avoided scolding her; mothers, beyond scolding, set out to discuss about it in public as well; parAnguSa nAyaki says “the beauty of his nose, being close to the divine eyes, is tormenting me”. Attiyum thURRiyum ninRu annaimIr ennai nIr nalindhen? en – what is the benefit? viLakkin sudarAy niRkum – shining like the flame of a lamp. Oh mothers! You are not letting me remain where I am and you remain firm in accusing me. What is the benefit in doing so? I don’t know if it is tall kalpa tree’s creeper or shoot, in close proximity – the divine nose of the one who mercifully ate the gathered butter is shining like a raised, big, firm flame of a lamp in my heart. annaimIr ennai nIr nalindhu en – Why are you who are focussed on pleasing me, now tormenting me like fathers who are focussed on advising me? How can you, who only look at my pleasure, torment me? nalindhen – Are you trying to stop that visualisation or are you trying to withdraw me? Would you engage in something which has no benefit? What are you trying to do even after knowing the strength of his nose? mAttu uyar … – If you are capable, please eliminate this doubt of mine. mAdu – near by, i.e. near one’s eyes. The way the divine eyes and the nose are positioned, it appears like a creeper which grows near an ocean, having the ocean spring as the sustenance. uyar – As said in sthOthra rathnam 32 “unnasam” (great). kaRpagaththin valliyO kozhundhO – Looking at its length, it can be termed as a creeper. Due to the consistent shape, it can be termed as a shoot. She is saying “aRiyEn“, since it is difficult to determine what exactly is it; and due to total equivalence [to both]. Ittiya … – emperumAn, being unable to sustain without the object that was in contact with the favourable ones, engaged in stealing the butter and got caught, and to negate his stealing, he would apply the remaining butter on his face; for her, while visualising, she even smells the fragrance of butter. The visualisation was so realistic, the smell of the butter was experienced. enadhu Avi uLLE – this is inside my heart. mAttiya – Implies radiant, lit. niRkum vAliyadhE – Will remain firm and torment. dhIpa (lamp) is generally kshaNika (transient) and prAdhESika (limited); unlike that, this is permanent and omnipresent; this is word uttered after considering the extent of torment. This entry was posted in thiruvAimozhi, thiruvAimozhi 7th centum on October 8, 2018 by Sarathy Thothathri.